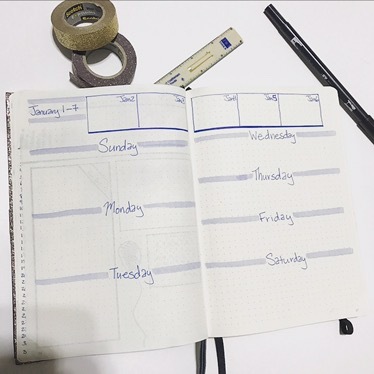 Last week on Instagram, I posted about starting a bullet journal, but at that point, I had jumped the gun a little bit because I had all my supplies, except for the journal. Well, today, after some obnoxious UPS tracking, my journal arrived and I got right to work! 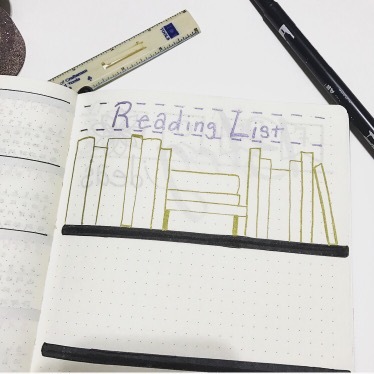 If you are unfamiliar, a bullet journal is a combination of a journal and a planner that you create to your liking all on your own (or with the assistance of stencils, templates, etc). It can be a very daunting task, but I love the flexibility and creativity it allows. I’ve also always been a person who carries around both a journal and a planner so I’m glad to combine them into one. If you were to google “bullet journal” your mind would quickly be overwhelmed with all the inspiration and possibilities that are out there. For me, this was very much the case, and some people are out here really going above and beyond. Don’t let this be a source of anxiety for you, or hold you back from starting, take the first step and try your best…for bullet journaling and everything else. A Journal-most people prefer ones with a grid or dots, so think Moleskins. Or, you can purchase the “official bullet journal” a Leuchtturm 1917. Pens- you can use the pen you picked up from the doctor’s office last week, or go pick up some of the many v fancy writing utensils out there. I use Sharpie Pens , Tombow Dual Brush Pens, and ek Tools Pens. A Tiny Ruler-not necessary but is nice to have and it is small enough to store in the back of your journal. Okay, so all supplies are on deck and you open your journal and you’re ready to go, right? No. Close the journal. Plan first, execute later. I had a 3 day waiting period before my journal came in the mail and during that time I scrolled through the many Buzzfeed articles, tumblr posts, and google images looking for layouts I liked and that I thought would be conducive to my life. When I found something I liked I screen shot it so that I could come back to it later. After this research, I was left with a list of what I wanted, what order it would go in, and screen shot examples that corresponded. 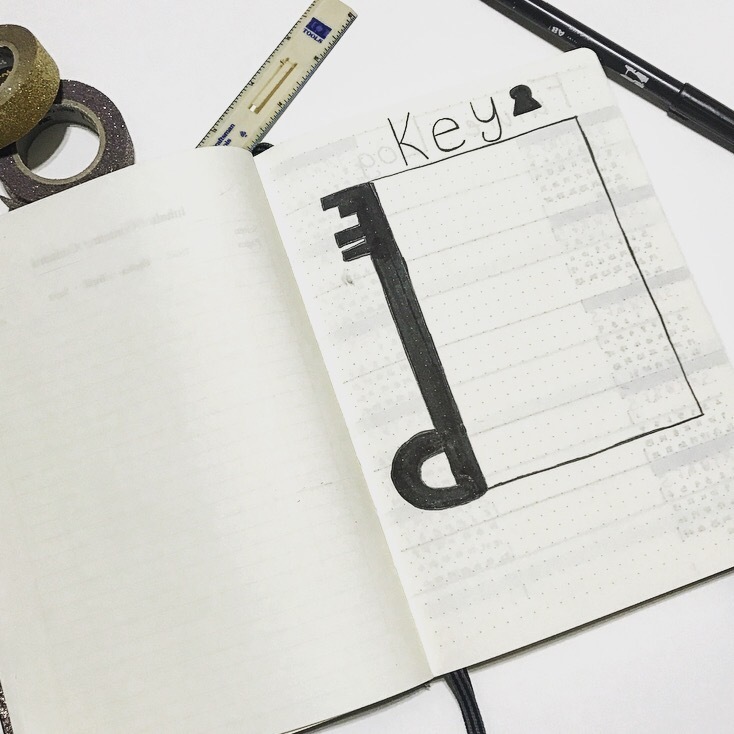 Key-I haven’t filled mine in yet because I’m still deciding what symbols I want to use, but this is basically a legend. For example, I may have an “x” to signify that a task is complete, or an –> to signify something has been migrated to another day/week, etc. 3. 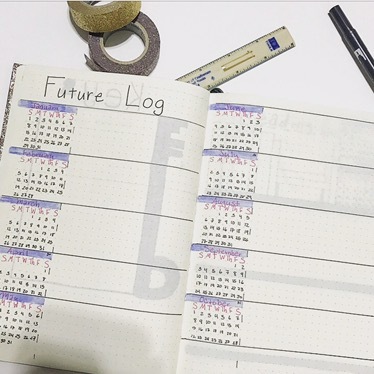 Future Log- A future log is pretty common in bullet journals and is used to pick out major events that happen in certain months. So your best friend’s birthday, an anniversary, extended vacation, etc. It also allows for you to see the whole year. 4. Reading List- This is an example of something I used to write in my journal instead of my planner, but now it’s all here! I’m always looking for/being recommended new books to read and I found this layout online which I thought was really cute! 5. 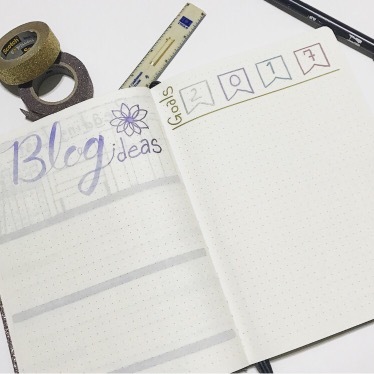 Blog Ideas & Goals-Obviously I have a blog so I wanted a page I could scribble post ideas on. Then on the next page will soon be filled with 2017 goals! 6. January-Here is where I get to the meat of the planner section. January is my birthday month so that was my decorating theme. On the left page is descending numbers that correspond to each day of the month. There, I will right major events, ie. 10. MY BIRTHDAY! On the same page, I included a simple to-do list for the month. Something I normally keep on sticky note on my laptop, so we will see how it works here. On the right page is “Monthly Affirmations” under it is a box with nothing include yet (lol) and another box for goals, as well as the calendar again. 7. Habit Tracker- Another idea original to the bullet journal idea is a habit tracker. 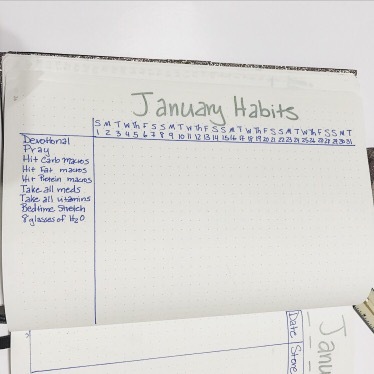 A place for you to list out the habits you want to keep for the month and track how often you stick to it or complete it ( The next picture is a closer view at my habits). 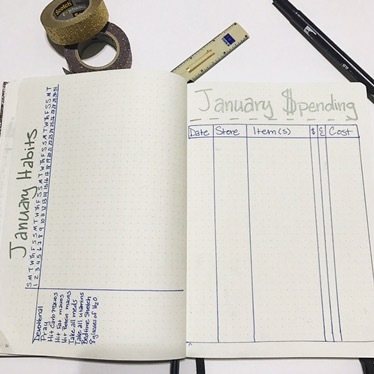 On the next page is a simple spending log. Something I know I’m bad at keeping up with so we will see. Adulting is hard y’all. 8. Week 1- Finally! I’m at my first weekly breakdown. Right away I want to point out that for next time, I’m going to start my week off with Monday and include Saturday and Sunday at the end of the week because I think that makes the most sense for keeping up with school assignments. As of now, I have many ideas for the uses the boxes on top serve: high and low of the weekdays, events/appointments I need to attend, etc. In between my 2017 Goals page, I left about 5 front and back pages open for me to add things later. This is not necessary as the index is there to help you find pages you may be looking for even if they are randomly after other unrelated pages. I knew that I would come across more things to include (like a wishlist) so I left some black pages but they will be used up eventually. But overall y’all, that’s it. It does take a good amount of time to set up, but now I just have to actually use it, then at the end of the week I’ll go in and set up the next week’s spread. If you have time, go ahead and get ahead as many weeks as possible! I hope this was helpful and I hope you give it a try. Remember, be nice to yourself. It doesn’t have to be perfect, it should just be enjoyable and useful! If you think you might start, comment below and let me know, I think half of this is having people that will hold you accountable to keep using it, so let’s be each other’s persons! Today is the last day of 2017, and as I was looking through the most successful posts for the year, this was one of them! 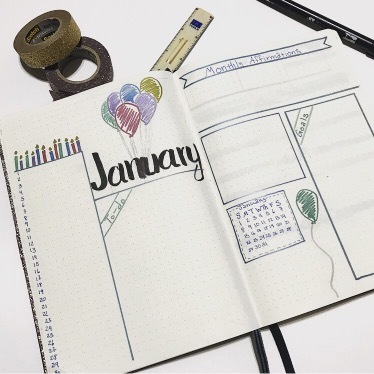 As the new year approaches, I know that organization is a popular resolution so I wanted to update this post with my experience using a bullet journal long term. It is a lot of work. After about March I stopped doing the habit tracker and just focused on using it as a planner and a place to write down notes/ideas. Making it pretty was not a priority. When you open your bujo in a meeting to write down dates and you realize you haven’t drawn that month out yet, it can be a little annoying. I was better at being ahead in the beginning, but I definitely had to block off time each week to make sure I was adding the following week, or month. Even doing so, I found one layout I liked and did that. No pretty additions. I’m doing something different this year. I went back in forth trying to decide what I wanted to do planner wise for 2018. I didn’t make a decision until Christmas morning when my Mom gifted me a Christian Planner (that’s what it’s called). It is a different layout than I would have chosen, but I like all the additional space it has for taking sermon notes, bible study notes, reflection, etc. BUT, I’m not giving up the bullet journal. I’m going to keep it and use it strictly to plan for this blog. If you have any questions feel free to comment below, shoot me an email, or slide in my DM’s (@lysseonlife) hah! Happy New! I hope you have a blessed start to 2018! I really enjoyed this particular post being that utilizing a planner is a MUST while trying to get through adulthood! Unfortunately I wont be using a bujo just yet since Ive just been gifted a jornal as welll but will definitely keep this method in the back of my head as an option!!! Ps. A blog post with book recommendations in the future would be cool, if you ever get stuck on an idea. Yay! Any planner is good as long as you use it. Thank you for the recommendation! I will definitely add this to my list!